Think you have what it takes to escape from prison? Well, you can find out at Escape IQ. It’s a real life escape room experience in DTLA. If you have never been in an escape room, it’s a group activity where you have to work together to find clues and solve puzzles to “escape” within a certain time limit. Escape IQ has two different rooms: Alcatraz and The Vault. 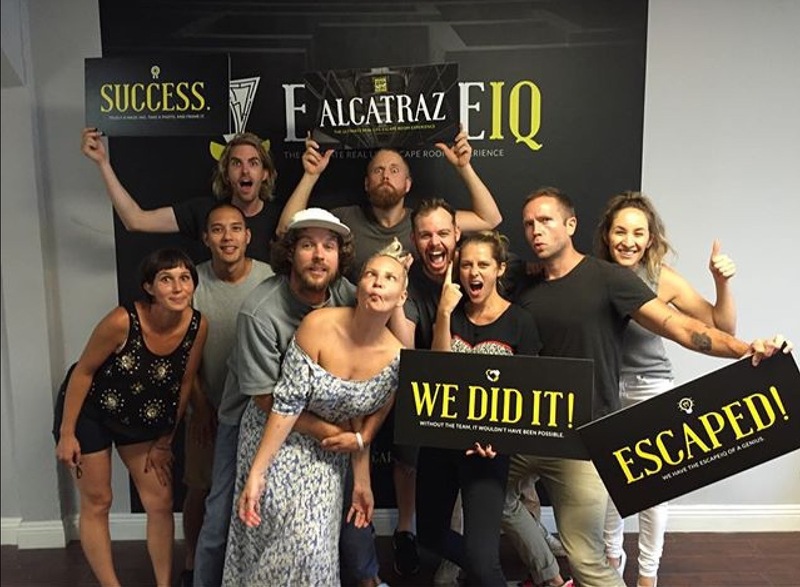 I rounded up a few of my smartest friends to give the Alcatraz room a try. Imprisoned in Alcatraz and driven almost insane with the inhumane conditions, you want nothing more than to break free from this fearsome fortress. In a nearby corridor, a violent riot has unexpectedly broken out and all prison guards have been summoned to restore order. Unguarded, you remain locked down inside the prison cell. You have one hour to uncover clues, solve puzzles and work together with the other inmates to find the way out before the guards return. We are then divided up. Half of our group is locked in the cell next door. The guide gives us 2 flashlights, locks us in the cell and says “good luck.” Okay, it’s on! I will not give away any spoilers because I don’t want to ruin the experience for you, but I will tell you this… communication is key. You must work as a team if you have any chance of escaping these prison cells. We are yelling from cell to cell, banging on the walls, etc. Suddenly we are in a real life version of The Shawshank Redemption. You aren’t allowed to bring in my cell phone, so I didn’t take any photos. I did find a few “approved” pictures on the Escape IQ Instagram page. You can see the cell has a bed, sink and toilet… that’s about it. One of the rooms has a locked briefcase. We are scurrying around the rooms in a panic trying to figure out what to do next… and time is ticking away. We found a few clues, but have no idea what to do with them. We are not stupid people, but we are stumped. There is a “help button” on the wall so we push it and we are given a hint… and then we start making some progress. Again, I am being vague because I don’t want to give away any details, but this set up is pretty elaborate. We were finally able to reunite our team and solve more puzzles, unfortunately we ran out of time. Everyone on our team is quick to put the blame on another person. Honestly, together we sucked! Apparently we are not alone. Of the 142 teams that have tried to escape Alcatraz, only 41 teams have made it out in the hour. The fastest team to escape did it with one hint in 38:07. Get this! One team escaped with no hints in just 43:30 (see photo below) and the singer Sia was on that time (without the wig). I cannot believe Escape IQ beat me. I’m a really poor loser, but I did have a great time trying. I can’t wait to go back to Escape IQ for The Vault room. I better make friends with Sia and her friends first. Round up some of your friends (only the smart ones) and give it a try. Let me know how you did in the comments section below or on the DTLAexplorer social media pages: Facebook, Twitter and Instagram. Good Luck! This entry was posted in DTLA Attractions and tagged Arts District, Downtown LA, Downtown Los Angeles, DTLA, Escape IQ, Escape Room. Bookmark the permalink.